Intel’s newest line of desktop processors bring with them a number of changes designed to sway favor with performance enthusiasts. These new parts bring Intel’s consumer processors up to eight cores, with higher frequencies, better thermal connectivity, and extra hardware security updates for Spectre and Meltdown. The only catch is that you’re going to need a large wallet and a big cooler: both price and power consumption hit new highs this time around. Our coverage of Intel’s announcement last week went into detail about the three new processors being launched today. But here’s a quick reminder of the latest silicon in the market. Today, three CPUs are being launched: the 8-core Core i9-9900K capable of hitting 5.0 GHz out of the box, an 8-core Core i7-9700K that’s a bit cheaper, and a 6-core Core i5-9600K that on paper looks like it could be a killer purchase. The new halo product is the Core i9-9900K, Intel’s first mainstream desktop socketable processor to have the Core i9 naming. 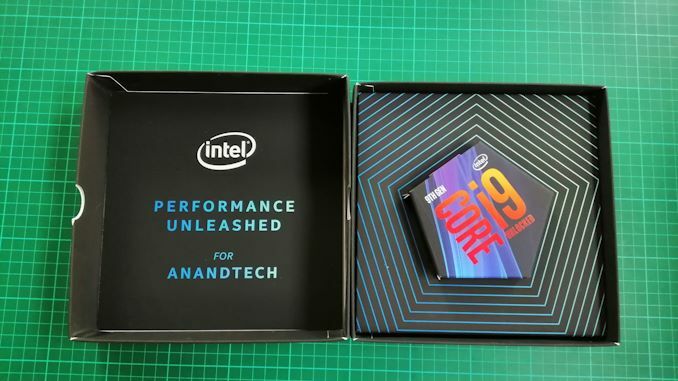 This is an eight-core, sixteen thread processor, Intel’s first in this product line. It offers a base frequency of 3.6 GHz and a peak turbo frequency of 5.0 GHz – which is actually a two-core turbo as we go into below. This is an overclockable processor, allowing users to push the frequency if the cooling is sufficient, and despite the memory controller still rated at DDR4-2666, higher speed memory should work in almost every chip. The Core i9-9900K also gets a fully-enabled cache, with 2 MB available per core for a chip-wide total of 16 MB. There’s also some integrated graphics, the same UHD 630 graphics we saw on the previous generation. This all comes in at a $488 suggested retail price, although no cooler is bundled. The Core i7 now sits in the ‘middle’ of the set, but the Core i7-9700K is seemingly no slouch. Intel has done away with hyper-threading on this part, giving it eight cores and eight threads only, however it does have a base frequency of 3.6 GHz and a turbo frequency of 4.9 GHz. For this part Intel has reduced the L3 cache per core to 1.5 MB, which might have an affect on some software, but the processor is overclockable and features the same DDR4-2666 support as the Core i9. The $374 suggested retail price is a bit easier to digest for sure, with the user safe in the knowledge that no two threads are sharing resources on a single core. This chip will be an interesting comparison to the last generation Core i7-8700K, which has two fewer cores but has hyper-threading. The Core i5-9600K suddenly becomes the baby overclocking chip, but still commands a $262 price, a few dollars more than the Core i5-8600K but in exchange for extra frequency and all the extras listed later in this article. For the money, this chip has a base frequency of 3.7 GHz and a turbo frequency of 4.6 GHz, along with the same DDR4-2666 support and UHD 630 graphics. All three parts are the first entrants into Intel’s 9th Generation Core product line, and under the hood they feature a refresh of the Coffee Lake architecture we saw in the 8th Generation Core products. They are built on Intel’s 14++ manufacturing node, the latest node which prioritizes high frequency and performance. The key highlights of this set of three processors, asides from all being overclockable, comes down to what Intel has done under the hood. In our information escapades, we were able to obtain the per-core turbo values for each processor. Intel still classifies this information as ‘proprietary’, so does not distribute it. However Intel’s partners are more than happy to give us the information, given that it has to be coded into the system BIOS anyway. The big uplift here is that 5.0 GHz turbo. 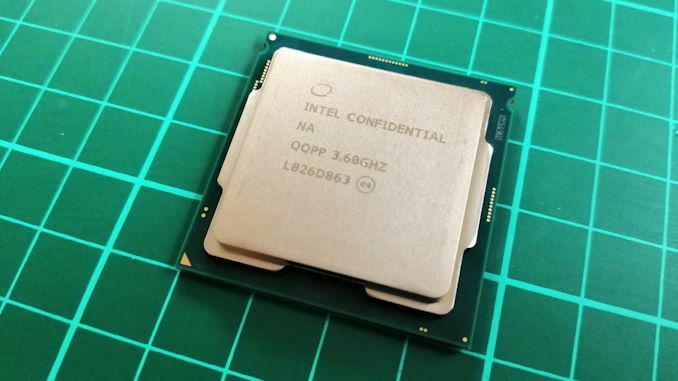 In our Core i7-8086K review, where Intel was happy to promote that chip as its first 5.0 GHz product, the fact that the 5.0 GHz value was on a single core was actually a downside – no matter how we tested the processor, there is usually enough running on more than one core that no user ever realistically sees 5.0 GHz at all. We only ever managed to see it flick up momentarily while waiting at idle. But the fact that the Core i9-9900K now has it across two cores means that we are more likely to see this high frequency in our single-threaded testing. All this aside, it would appear that Intel is also forgoing hyper-threading on most of its processors. The only Core processors to get hyper-threading will be the Core i9 parts, and perhaps the Pentiums as well. This is partly to help make the product stack more linear, and so cheaper chips are not treading on the toes of the more expensive ones (e.g. though unlikely, a quad-core with hyper-threading might outperform a 6-core without). The other angle is one of the recently discovered side-channel attacks that can occur when hyper-threading is in action. By disabling hyper-threading on the volume production chips, this security issue is no longer present. It also ensures that every thread on that chip is not competing for per-core resources. 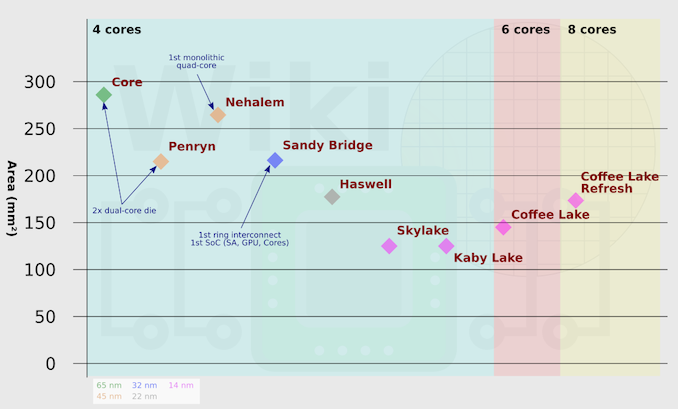 Intel’s 9th Generation Core family is built around the Coffee Lake platform, and as the processors have not had any microarchitectural changes, they are refreshes of the 8th generation parts but with the product stack laid out a little differently. For those keeping track, Coffee Lake was already a rehash of Kaby Lake, which was an update to Skylake. So we are on Skylake Refresh Refresh Refresh. Making for what’s essentially the same 2015 core CPU microarchitecture now going into 2018 (and beyond). Back when Intel launched the first Coffee Lake processors, the 6+2 die design of the i7-8700K was around ~151 mm2, an increase of ~26mm2 over the 4+2 design of the i7-7700K (~125mm2). Back then, that was a jump from Intel’s official 14+ to 14++ manufacturing nodes, which due to a relaxed fin pitch made everything a bit bigger anyway. But if we take 26mm2 on the high end of adding a pair of cores to the die size, then we can predict that the 8+2 design of the Core i9-9900K should come in around ~177 mm2, or a 17% larger die size. At 177mm2 including integrated graphics, this would be half the size of the Core i7-5960X, although with only half the memory controllers and PCIe lanes too. Even with that, it’s a sizeable decrease. Naïvely one might suggest that a 17% increase in die area might directly translate to a 17% increase in price. A 17% increase in the tray price of the Core i7-8700K puts it in the region of $420, whereas the official pricing is at $488 for the K-equivalent processor. Given how Intel bins its chips (one die can be sold for half as much as another), it is hard to say how much this $488 increases profit margins, although it is widely expected that it will. If we look at die sizes of the top end chips, through the decade of quad cores the die size was actually decreasing, from the quad core of Nehalem at over 260 mm2, down to Kaby Lake at 125 mm2. It has now steadily increased as more and more cores have been added. It might be crazy to think that Intel would happily spend 260+ mm2 on a mainstream silicon die today on its latest manufacturing process. Over on the next page, we’ll cover Spectre/Meltdown fixes and discuss the updates to Intel’s STIM strategy. Previous Post Sentiment Speaks: Is Bitcoin Ever A Buy-And-Hold?